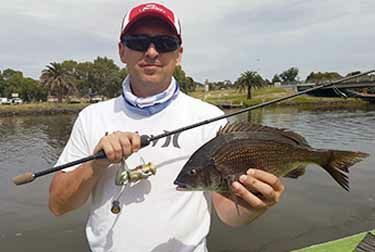 Mark Moseley went fishing on the Maribrynong river not far from Flemington. Testing out his new light spin rod outfit Mark landed many Bream including 3 legal size Bream. The biggest was a new PB for Mark which was a very plump and healthy 37cm Bream which gave a really good fight. Mark handled the Bream really well not rushing and allwoing the Bream to take runs with the reel set quite loose. He also had a pair of healthy 33cm Bream. Well done Mark who is now chasing a 40 plus cm Bream.